Summary: There are times we all feel we need more than one heart to get through. When Briana’s father dies, she imagines she has a new heart growing inside her. It speaks to her in her Dad’s voice. Some of its commands are mysterious. Find Her! it says. Be Your Own! How can Briana “be her own” when her grieving mother needs her to take care of her demanding little brother all the time? When all her grandpa can do is tell stories instead of being the “rock” she needs? When her not-so-normal home life leaves no time to pursue her dream of writing for the school literary magazine? When the first blush of a new romance threatens to be nipped in the bud? Forced by the loss of her favorite parent to see all that was once familiar with new eyes, Briana draws on her own imagination, originality, and tender loving heart to discover a surprising path through the storm. About the Author: Laura Geringer Bass is the author of over 20 highly acclaimed books for children, tweens, and teens. Her new novel for middle graders about friendship, love, and loss — The Girl with More Than One Heart — is the lyrical story of a courageous girl who imagines she needs an extra heart to navigate her grief after the death of her dad. It will be published by Abrams this Spring. Laura serves on the National Advisory Board of First Book, a non-profit organization that has delivered over 170 million books to children in need and as a mentor for Girls Write Now and Prison Writes, teaching teens at risk. Review: This book looks at the struggle of grief when life keeps moving on around you. And like another book I love, Courage for Beginners, it shows the struggle a child has if a parent is suffering and they have to step up in a way that is not what their peers have to. Briana doesn’t know how to deal with the grief and with her mother incapacitated with grief also, Briana finds that she needs a second heart to help guide her through this huge bump in her life. Briana’s story also shows the struggle yet love of being a sibling to a child with special needs. Written beautifully in a way that will pull at your heartstrings, Bass’s story shows how one girl uses art, love, and courage to make her way through a loss that is unimaginable for most of us. 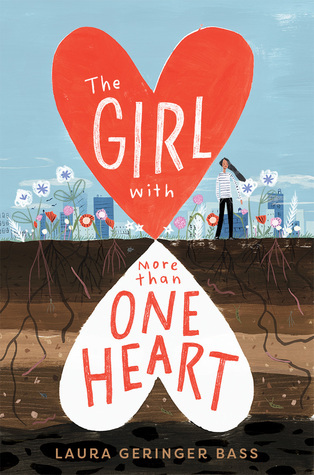 Teachers’ Tools for Navigation: The Girl With More Than One Heart needs to be in classroom, school, and public libraries. There are so many readers that need this book. There are other readers that will want this book. There are definite readers for this book. Another way in the classroom that it could be used is a mentor text for writing about memories. Briana’s second heart shares memories with her, one of the ways we get to know her dad, and the memories are so full of imagery. There are many sections that could be read for a mentor text when asking students to write a personal narrative. How did Briana use art to help her through her grief? How did Briana’s life change after the loss of her dad? Aaron is described in the summary as her demanding little brother, but Briana loves him. What are some examples in the story that show this love? How does Grandpa Ben help guide Briana? Briana’s second heart is only figurative. What does it represent?